So our day with the Dre's did not end at Olvera Street. Afterwards we headed to Wilshire Blvd. to LACMA to check out a Chicano Art exhibit. I thought I had never been before, until we pulled up next to the La Brea tar pits. Then I remembered that I had been there. On a field trip in 7th grade. And it was on the bus parked in front of these tar pits where Matthew Coulthard planted my first kiss on me. Aww Tar-y Sludge-y Memories. So after figuring the maze that is LACMA we found what we were looking for. I only have great things to say about this exhibit. It was a small sample of "art after the Chicano Movement". What I liked best about this exhibit was all the pieces from 'Asco' a collaborative art group from East LA made up of Pattsi Valdez, Henry Gamboa, and Gronk. Once while at UCSB Gamboa came in and spoke to my class. He was amazing and their art pieces are amazing! After the exhibit The Phi crashed and we took a walk out around the tar pits. Here is Nino really getting into his art. The tar pits are surrounded by a city park. And in random spots there are orange cones covering spots where the tar is oozing up. Very strange. 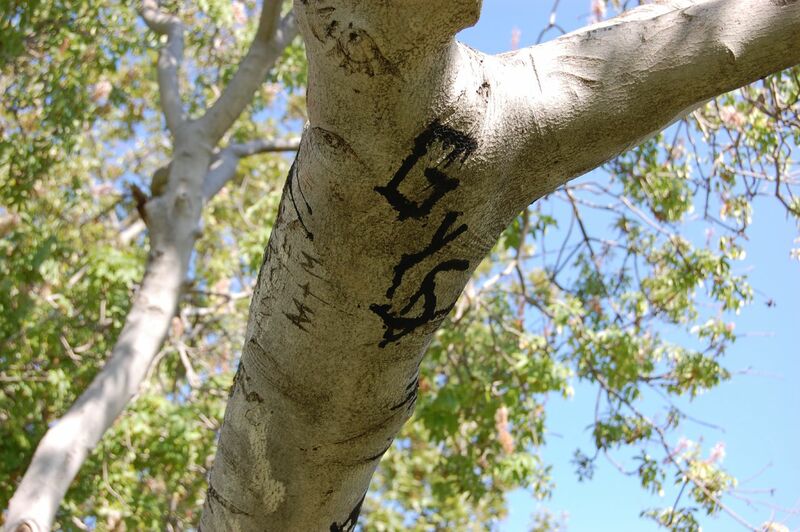 PR Dad noticed a tree where people declared their love for each other in tar. The Phi woke up and we headed to the American Art gallery. It was there that we realized that we were not fans of American Art. So we hit up the gift shop and The Phi picked a butterfly/castanet toy. Must be that Spanish blood in her. We took a short walk around the front of the museum. 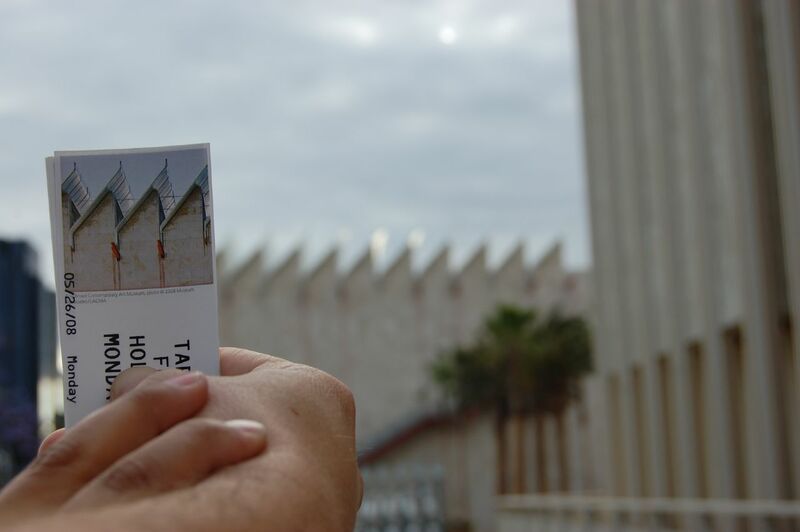 PR Dad noticed that the picture on his ticket was the building in front of him. We walked through a giant installation piece of lamp posts. The Phi found a way to even relax here. It was a great day and I think The Phi really needed this day of family and culture and art. Okay I know she needed it. Sometime during our day out, she told me she wanted to go home to play guitar hero. We ended the day in downtown Fullerton and a great place for dinner called Hero's. Giant drinks, ginormous nachos, and huge burgers. It was a wonderful holiday with The Dre's!